The Chief of the Phuket Lifeguard Service yesterday welcomed the handing over of the first-ever Thai-language lifesaving manual, drafted by experts from the Australian Life Saving Association (ASLA), and vowed to use the manual to train lifeguards serving at beaches along Phuket’s west coast. Present at Loma Park, by Patong Beach, for the handing over of the manual yesterday (Aug 4) was Australian Foreign Minister Julie Bishop. 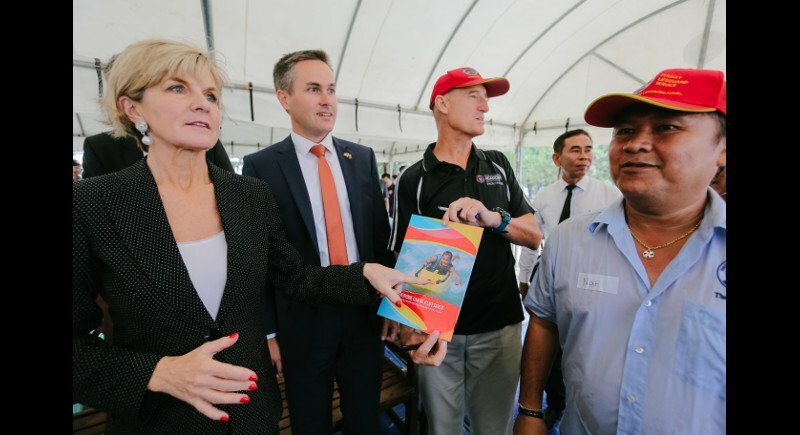 “It is an honour for the Phuket Lifeguard Service to receive this manual and to receive Australian Foreign Minister Julie Bishop,” Phuket Lifeguard Chief Prathaiyuth Chuayuan told The Phuket News. “We will use this manual to train lifeguards at other beaches, not just in Phuket but elsewhere in Thailand,” he said. As part of the hand-over ceremony yesterday lifeguards demonstrated their skills with a surf rescue simulation. While the demonstration was underway, several tourists entered dangerous surf just down the beach, forcing lifeguards to spring into action to ensure the swimmers were safely escorted away from the danger area. Speaking at the official opening of the Australian Consulate-General in Phuket on the bypass road earlier yesterday, Ms Bishop explained to the press that the manual had been put together with funding from the Australian Government’s aid program. “The lifesaving movement has a very long history in Australian because Australians are lovers of watersports and spending time at the beach and so water safety is a very important part of the Australian lifestyle,” Ms Bishop explained. “For a number of a years now Australian lifeguards have been working in partnership with lifeguards here in Phuket to ensure that Australian tourists and not just Australian residents but also Thai citizens practice water safety while here at the beach. “So what we will be releasing today is the first Thai-language international best-practice manual for lifesaving focusing on drowning prevention, rescue, resuscitation and all according to world’s best practices,” she she said. “The Australian Government provides consular services to ensure that Australians who get into trouble overseas can receive an appropriate level of assistance,” Ms Bishop said. “We have just launched a new consular strategy which emphasizes the need for Australians to be self-reliant – to take out health insurance, to take out comprehensive health insurance – but also to register on our smarttravller website (click here) so that at least our mission our post knows when the Australian is in the country. The issues of safety is of course important and we urge Australians to take care of their safety, to abide by local laws and customs and to ensure to have a safe and happy experience, but that’s why our consular staff are well experienced in looking after Australians who do get into serious trouble overseas. We hope it doesn’t happen too often, but when it does our consular staff are professional and are able to assist.